A life of from 10 to 50 years is of medium length for a mineral operation. Continuous backï¾­toï¾­contour reclamation techniques are sometimes feasible, but the volume of overburden is often insufficient. The longer life of such pits and quarries makes concealment more important during the operational phase and decisions about an eventual afterï¾­use more problematic. One cannot be sure what types of landform and land use society will desire in 30 or 40 years time. Quarry operators have argued that because of this uncertainty they should be allowed maximum flexibility in planning their operations. Since there may be an unexpected demand for picturesque ravines, holes to accommodate waste products, urban land or agricultural land, they prefer to get on with the digging and plan an afterï¾­use at a later date. Since the oldest mediumï¾­life quarries of the mineral planning age are only now becoming derelict there is less experience of mediumï¾­ than shortï¾­life quarries. Chalk and clay workings illustrate the problems. In 1952, five years after Britain's Town and Country Planning Act was passed, the Minister of Housing and Local Government held public inquiries into two major applications for mediumï¾­life quarries in Southern England: for clay working in Bedfordshire and chalk working in Essex. Both applications were approved but, as recommended in the Scott Report, landscape conditions were attached to the planning permissions. They did not work. In Bedfordshire the Minister wrote that: All waste arising from the working or processing of clay shall be deposited in the workings in such a manner, and the excavated areas shall be further restored by such filling and levelling as may be agreed with the local planning authority, having regard in the latter respect to the availability of suitable filling materials at suitable times on reasonable terms (Minister of Housing and Local Government July 1952). In Essex the Minister wrote that: He considers first and foremost that the best possible use should be made of all overburden which has any agricultural value so that as much land as possible may in due course be returned to food production... In general, he thinks that an undulating surface is to be preferred to a more or less uniform level and that abrupt breaks in levels should, as far as possible, be avoided. Consideration should also be given to the possibilities of tree planting. The general object should be to leave the workings, after excavation has been completed, as pleasant and useful a place as may be practicable within the possibilities of restoration at reasonable cost (Minister of Housing and Local Government August 1952). These opinions, which were obviously wellï¾­intentioned, became landscape conditions under which the minerals were worked. Alice Coleman, a famous geographer, attended a 1952 public inquiry into the chalk working on Thamesside and was very hopeful that they would result in eventual restoration (Coleman 1954). She was wrong [Fig 6.9]. In 1996 there are a considerable number of abandoned pits in both Essex and Bedfordshire which have not been reclaimed. Nor were they concealed during their operational life. It is very evident that the conditions imposed on the 1952 planning permissions were ineffective and that there are lessons to be learned. In Essex, the problem arose from the Minister's loose phraseology and from the use of the word 'reasonable' in connection with reclamation costs. It was interpreted to mean that the excavations need only be reclaimed when the company can make a financial gain from the work. In Bedfordshire, the Deputy Chairman of the brick company announced that 'We have always had in mind that we have had assets in our pits' (Bugler 1975: 142). They were able to realise some of these 'assets' by charging the Greater London Council and the Central Electricity Generating Board for the right to dispose of waste material in the old pits. 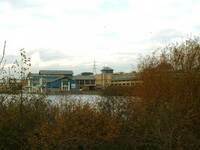 One of the clay pits was made into a reservoir and leased to a water sports club. Some of the chalk quarries in Essex are also being filled with waste materials but it has proved a physical impossibility to backfill the quarries to produce 'an undulating surface' which can support 'food production'. Since the chalk quarries are on the fringe of London some have been profitably reclaimed for industrial buildings which are conspicuous on the flat quarry floors. No one could think them as beautiful as the rolling agricultural land envisaged by the Minister when he gave permission for the workings. Chalk extraction has also taken place in North Kent and some quarries have been backfilled with overburden and refuse. In 1952 it was not known that these materials would become available. The quarries are now agricultural land of low productivity and poor visual quality (Turner 1984). A nonï¾­agricultural use would be preferable, if it was visually satisfactory.